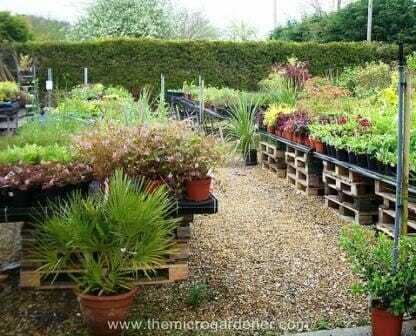 Growing vertically saves space and pallets can be used in a number of ways to stack plants. I’m sure this pallet planter project could become addictive! Britney created a stunning planter by stapling landscaping fabric onto the back of this pallet, filling with soil and her favourite plants. Inspiring result! See below for tips on watering. Maximum space is used here both vertically and horizontally with this abundant veggie patch filled with shallow rooted herbs and vegetables. If planting edibles directly into pallets, you may want to consider buying new and read the safety tips at the end of this article. An amazing quantity of food can be grown in a one square metre pallet garden. This one is intensively planted with luscious veggies! Even a plain pallet can make a stunning planter against a contrasting backdrop. Are you thinking up the possibilities? This vertical planter was built as a functional screen to hide an unsightly water tank from a kitchen window. A low-maintenance succulent pallet garden is a clever solution! This pallet was salvaged from the side of the road & painted a cheery yellow to solve a privacy problem for the owners while sitting out on their exposed deck. Now it’s a colourful feature planter box & an inviting place to sit. This project inspires lots of variations such as a fragrant edible herb garden in pots on one tier & colour in between. Adding hooks, brackets, tea light candles or garden art also opens up the possibilities. 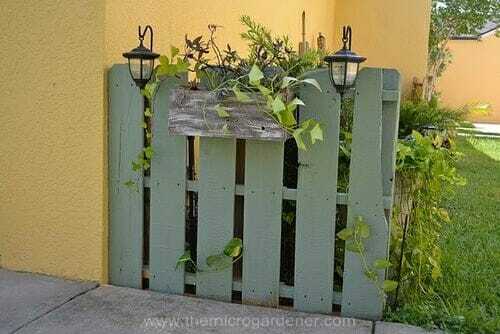 Create a simple painted feature fence with one or more pallets and a few garden accessories. Hardwood pallets are a lot cheaper than buying timber for fence panels and if coated with a suitable sealing paint or finish, will have a reasonable lifespan. 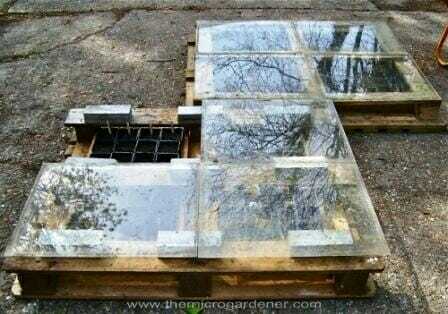 This nifty and inexpensive greenhouse has been made from two salvaged pallets. A great solution for raising plants if you live in a cold climate. 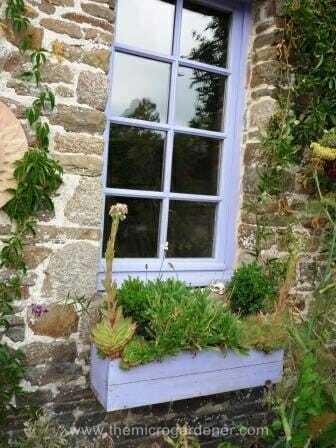 A simple window box made from a repurposed pallet coordinates well with a salvaged window. In stage 1 of this project, square pots have been tucked snugly into the pallet in four ‘windows’ – this is a portable greenhouse that could be useful in many situations or cut down to size and stacked vertically. In stage 2, panes of glass or perspex are added to each ‘window’ in the greenhouse on top of pavers as needed. 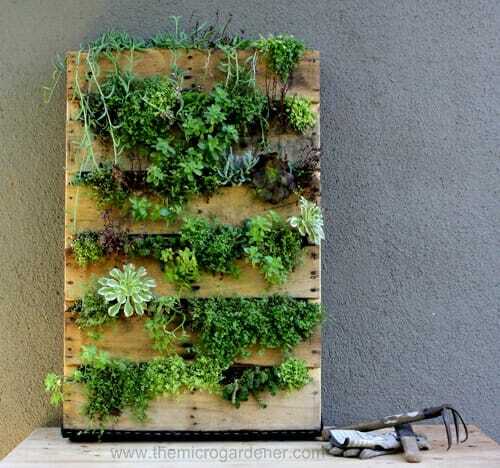 Try making this simple vertical pallet garden with pots. This idea could be adapted for use as a privacy screen, wall art, herb planters or just a decorative feature. Pallets make great low-cost compost bays like this single Compost Bin with a Hinged Gate or a simple 4 Pallet Compost System. This neat single compost bin is ideal for a small space garden. 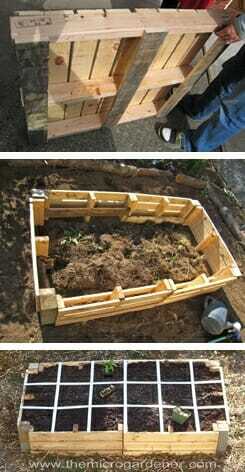 Or visit eHow for instructions on How to Build a Compost Bin Using Pallets. An edible pallet garden on a narrow balcony. 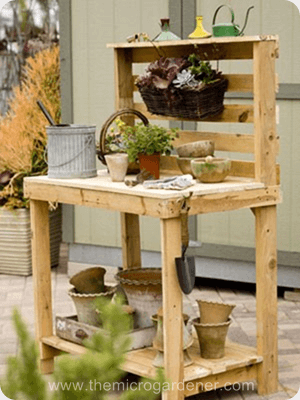 A wooden pallet converted into a useful potting bench. 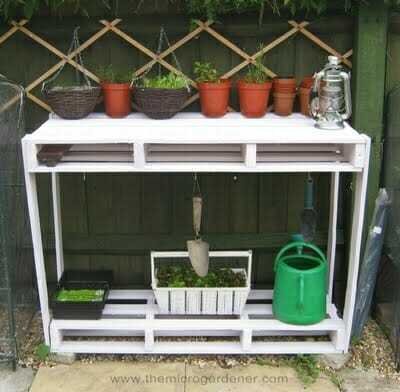 A potting bench with the back made from horizontal timber slats provides additional hanging & storage space. The side of the bench can be used to hang small tools. Another low cost pallet bench storage solution. DIY Planter with Succulents – these hardy plants suit these next two projects. A hardy alternative to edibles are succulents that are drought resistant with low water needs. 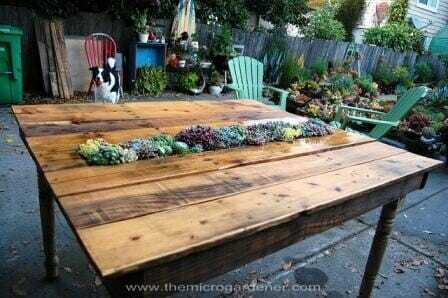 This DIY project shows how good a pallet can look with a stained finish and a low maintenance succulent centrepiece. An easy low-cost solution for making a raised vegetable garden. Pallets were used in this project to create a low-cost raised garden bed for square foot gardening – protecting the timber inside the bed with a plastic liner will help preserve the life of the structure. 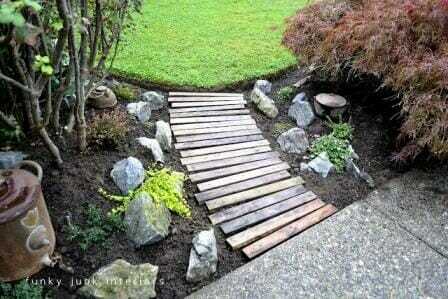 Repurposing a pallet and using individual timbers makes an easy pathway. Using a protective sealant will provide a longer life. 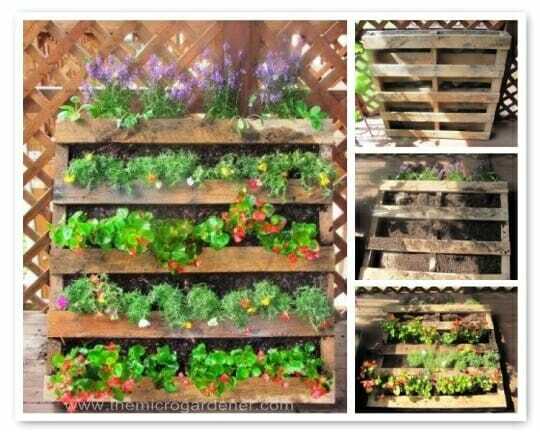 I hope these pallet garden projects have inspired you with a few ideas on ways to upcycle pallets at your place! SAFETY FIRST! If you intend growing edibles in your pallet garden, do your due diligence first. You can use pallets as support structures rather than planting directly into them. No VOC or eco-friendly preserving treatments may also be an option. Remember to use PPE (personal protective equipment) such as gloves and a mask when handling or cutting timber. The ISPM-15 mark is now very commonly seen on wood packaging in Australia including pallets. Additional information may be included in the mark e.g. DB for debarked, KD for kiln-dried, DUN for dunnage. The packaging manufacturer’s name may also be included. Heat treated (HT) marked hardwood pallets are safer to use rather than those that have been fumigated and marked chemically treated (CT) or pressure treated. See a HT stamp here. For US, Canada and Europe, see How to Tell if a Pallet is Safe for Reuse. 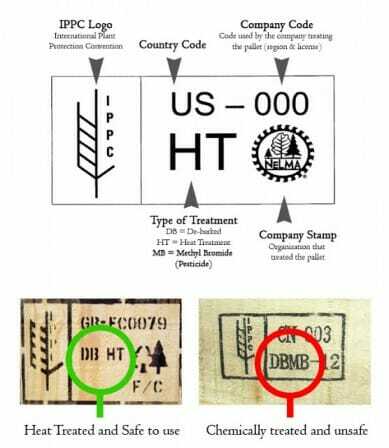 US Pallet Treatment Stamps – helpful to identify good wood. For Australians, check out the Recycling Wood Pallets & Packaging. It contains many tips for uses, imported and local pallet chemical treatments and where to locate wood recycling businesses. Be courteous! If you are salvaging pallets from a commercial location remember to ask first. Many businesses are happy for you to remove them, but some pay a deposit and have to return the pallets to get a refund. Check what the pallets have been used for to avoid chemical contamination. It’s wise to Choose Safe Containers for Growing Food especially with any material with a past life! Pallet timber varies widely – from new to old, pine to hardwood and how it has been used and treated. Timber is porous and can form a breeding ground for bacteria and moulds, especially when wet or in humid conditions. Many have been treated with chemicals to prevent insects and fungal attacks on the wood, especially if they have been imported. Others are used by businesses to store chemicals or toxic industrial waste. So please consider the Precautionary Principle and err on the side of caution. Avoid wood dust and composite wood block pallets that contain formaldehyde – both are known carcinogens. There are some useful tips on identifying treated wood and which to choose/steer clear of in the following articles: ‘How to Tell if Wood Pallets are Safe for Crafting‘; ‘All You Ever Wanted to know about Pallet Wood‘; The Scoop on Safe Shipping Pallets and ‘How to Determine if a Wood Pallet is Safe for Use‘. To help you make an informed decision about using timber in DIY projects your garden, also consider learning more about Pressure Treated Wood – Its Uses, Limitations & Safety Considerations and Using Pressure Treated Wood for Raised Garden Frames – Is it safe for growing food? Pallets can be stacked to make more easily accessible benches and even store other objects horizontally on the narrow pallet ‘shelves’. Storage solution for areas that suffer from flash flooding. 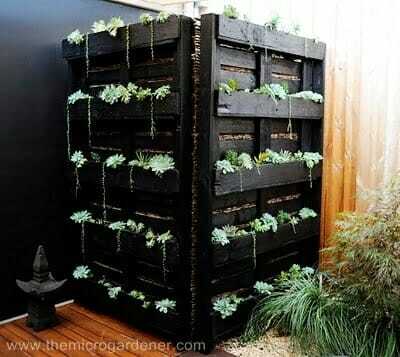 Watering vertical pallet gardens will be an issue you need to plan for. As in any container, plants require sufficient moisture, light and nutrients to do well. If you want to avoid spending too much time hand watering, consider installing a drip irrigation system before adding your plants. The bottom two rows will be the driest. So consider succulents or plants with low water requirements. 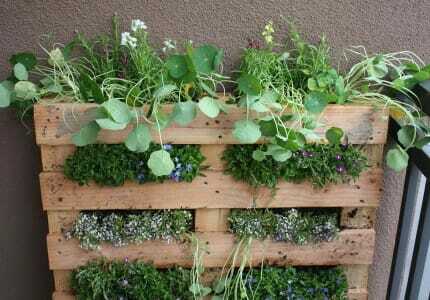 For vertical pallet gardens, add a quality potting mix rich in nutrients and moisture holding capacity. 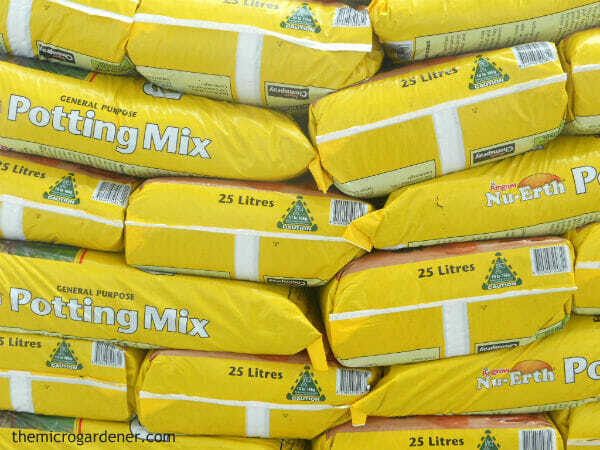 Bagged soil mixes are likely to dry out too quickly and starve your plants without the addition of other ingredients. 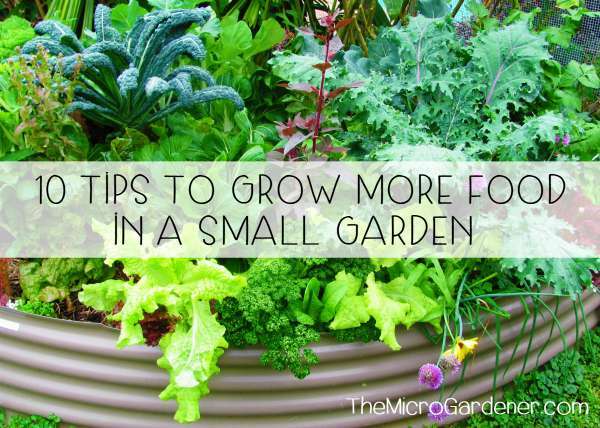 Consider making your own potting mix so you have the confidence your tiny gardens will hold the moisture well and not dry out fast. Depending on what you want to plant into pallet gardens, you may find it tidier to staple a second layer of landscape fabric to the front facing side of the pallet (underneath the timber slats). This will help hold the soil in and prevent mess when watering. Remember annuals will need replacing faster than perennial plants so if you are looking for a low maintenance vertical pallet garden, choose long lasting perennials like rocket (arugula) & chives! 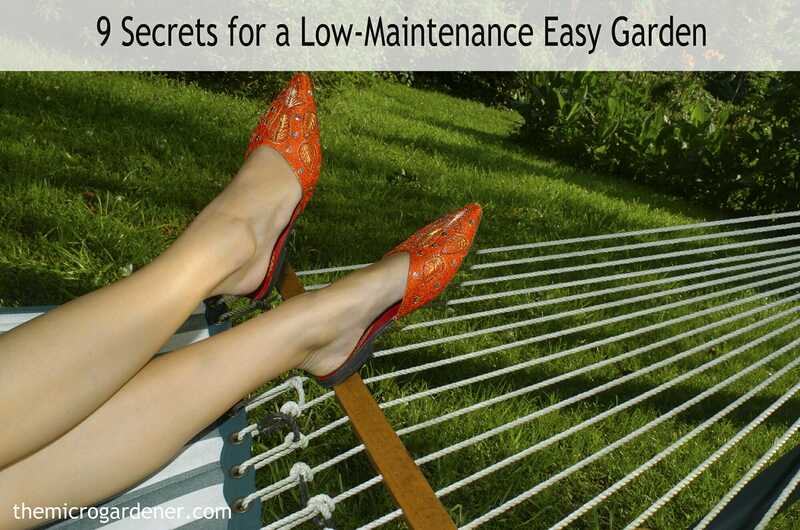 Intensive planting does require higher maintenance for your garden to stay healthy. Consider the time you have to care for it before embarking on your project. Renters and balcony gardeners should check the body corporate regulations as to what is allowed first! Remember to consider the additional weight of a vertical pallet planter too. Wear gloves when handling as many have splinters, nails or staples and need a little TLC. Use a pallet to keep your container gardens up off the ground. Screw 4 strong castors to the bottom corners of a pallet and you have an instant portable garden. An easy solution for moving plants around into/out of the sun. For tips on building with pallets and where to source them read How to Build with Recycled Pallets. 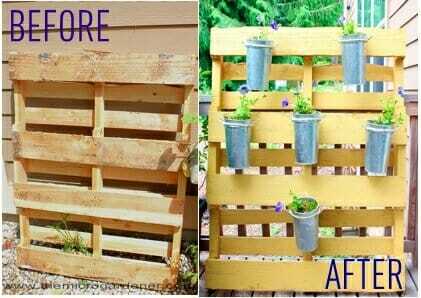 So what are your thoughts on upcycling pallets? Which idea are you inspired to get started on? 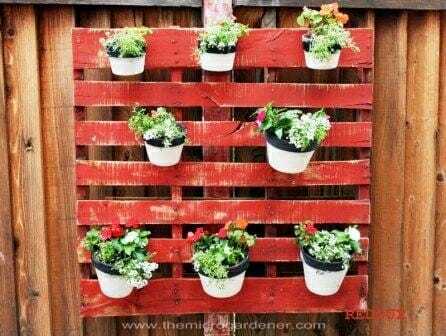 Related Articles: DIY Pallet Planter; DIY Projects; Clever Plant Container Ideas; Repurposed Container Gardens – Turn Trash into Treasure; 15 Helpful Design Tips for Vertical Gardens & Ten Benefits of Using Repurposed Planters. Thank you for all your ideas…. they are so smart. 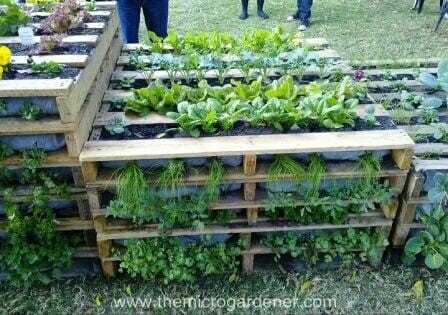 I did my horticulture training in Tasmania Australia and have brought many ideas back to the states but pallet gardening is a new one that I will share with many. I am in the process of putting together a pallet garden. My big biggest concern is the the temps are reaching 100 F/ 37C and there are no seeds available this far into the spring. Anyway, I will find a way to get my hand in the soil. Thanks again. Thanks for your feedback. Did a LOT of research putting this article together and glad you found it helpful. It gets hot here too. May I suggest a solution for your high temps? 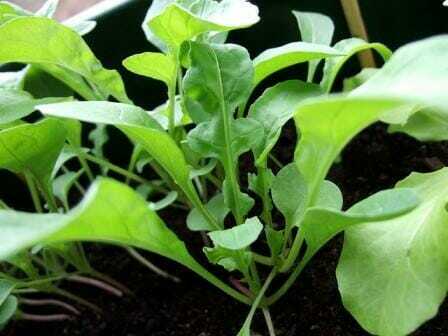 Consider growing some herbs and vegetables as microgreens in a controlled environment. This is a great way to still get food on the table when the heat is unsuitable for growing many crops outdoors. You can raise seeds indoors or a sheltered environment such as a well lit patio that doesn’t get blasting heat from the sun. I have a free tutorial on microgreens which may be helpful as a starter. Hope this helps. I’m living in Cambodia, I’m a Cambodian. 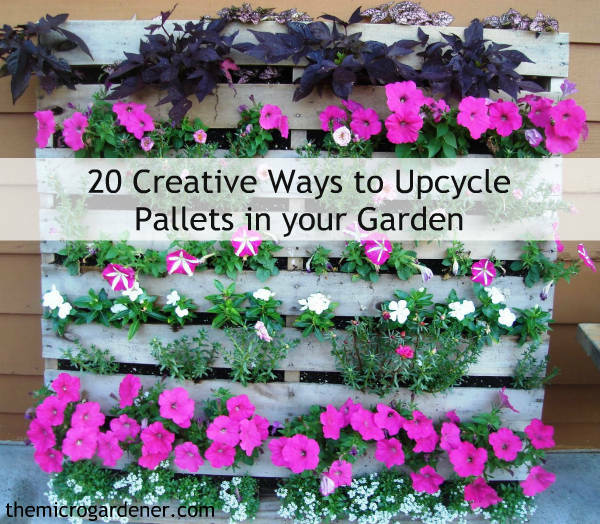 I interested about pallet upcycled gardening. 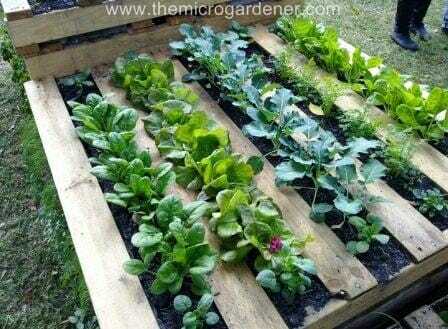 Can you tell me how many advantages and disadvantage on pallet upcycled gardening. Please send answer to my email address. 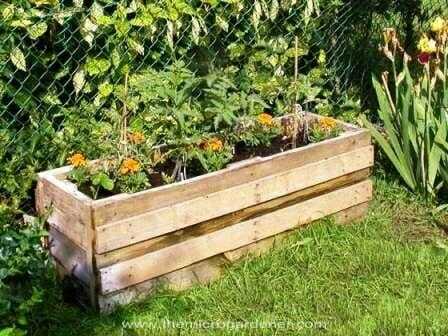 Check out this article on making a pallet planter – you’ll find more info there. 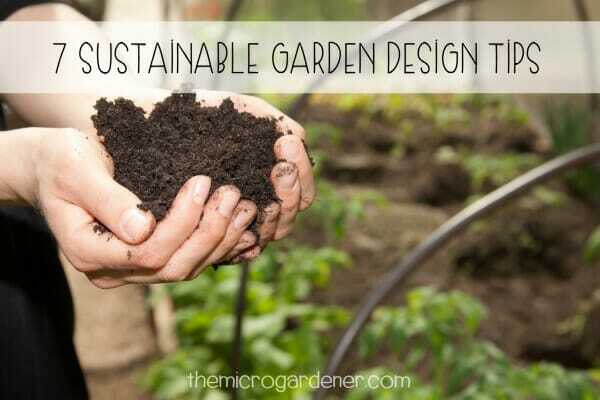 Best of luck with your upcycled gardening. I am very interested in the pallet benches, when attached, makes a picnic table. I cannot find this on your site. Can you please email me information/pattern so I can have someone make this for me. Is this what you’re looking for? Good luck! I have gardened for too many year to mention. It was easier back in Scotland mainly as nature watered for me. I am so excited to try some of your ideas out. As I’m not as young as I used to be, I think this will work well. Reduce the bending and I can still have my fresh produce. Should I introduce worms into the earth in planters. WOW! these are amazing ideas! I love them so much I just called my local hardwear store to see if they have any for me & they do! I’m going to start on some of these this weekend. Thank you so much for sharing them with us. I was having such a dilemma with my old garden because of my yard being such a weedy place & the soil isn’t very good, This will certainly help me grow my veggies now 🙂 Thank you again! I made an american flag out of a pallet and put it in my flower bed this year. Looks amazing. I now want to make a bench I saw out of them as well. Sounds like great repurposing Nikki! Enjoy your project. I work in a small school for children with severe learning difficulties. We have been asked to make a pallet garden for a competition – my idea was to make a rainbow garden so that it would be very visual and sensory rich for the children but I am not a gardener and have no idea where to start. We have a pallet but that’s about it. Any help would be great ! I suggest you start with the information in this post and watch all the video tutorials. They are quite detailed and show you step by step what materials you need, how to line the pallets, fill with soil (I’d strongly recommend using my potting mix recipe for this project) and plant them out. I would suggest you pre-paint your pallet in rainbow colours first (with non-toxic paint – there are many external low or no-VOC paints on the market). It would be too difficult to paint after planting. I would also suggest you consider adding an irrigation system if the children would find it too challenging to water the pallet planter. Another suggestion is to cut a pallet in half horizontally and put the two halves side by side so they are shorter and easily accessed by the children – then they could sit and smell for longer periods. Or even use 2 pallets and make a square by cutting them both in half, staking them in the corners for support. With plant selection, perhaps choose lots of colourful, fragrant flowers and edibles like marigolds, petunias, red/green/purple lettuces, lemon balm, chocolate mint, peppermint, geraniums etc. See my post on ideas for sensory gardens. Funky Fence – colourful and bright. Pencil Gate – you could saw the pallet timbers off to make points and use them to make a gate or fence. A Rainbow Raised Garden Bed – this could be an easy fun project to try with plants I’ve mentioned above. Hope this gives you some inspiration and ideas. Hello! Thank you so much for the info but I am situated in South Africa. :o( will definitely view their website! House built with recycled tyres and shipping pallets – may give you some contacts or ideas you can adapt to a smaller dwelling for chooks. Hi, Anne, I began “pallet gardens” in August and tcmtech dripper irrigation from rain barrels in September. The dripper is totally diy and uses a glass pot lid in the rain barrel as a float. You can get 2 weeks of irrigation from the barrel (or 2 hours if you want). I used it to drip water on a pallet garden. Anyway, the pallet gardens have being going through “rapid prototyping” so each new one is different and (hopefully) an improvement over the previous one. I am making number 7 today! Very different from number 1. Another thing is using an aquarium bubble pump to recirculate water in pallet gardens and vertical pallet planters. (I have in the past shown that you can pump water really high with the bubble pumps) Over 10 ft high! 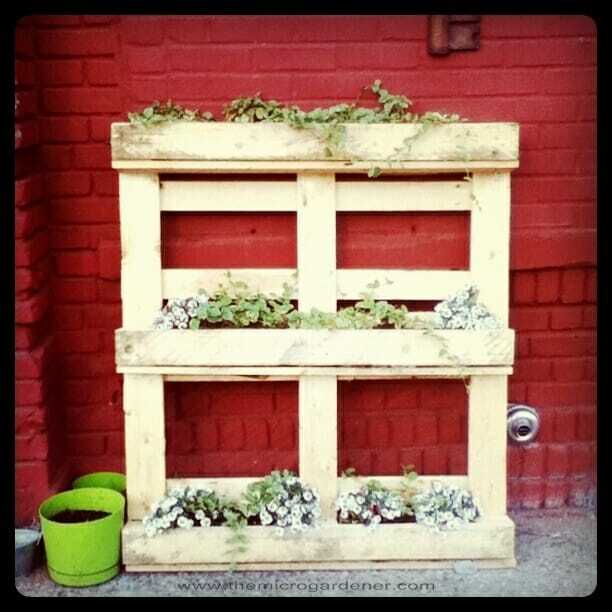 Vertical pallet planter number 2 is made from 2 pallets. I broke them down and put them back together again. The shelves slope to the back and I think this is vital to its success. So check it out on yourtube and if you like any of it, please give it thumbs up or a comment. It takes a lot of time and time is money so if nobody uses it, it makes it kind of pointless. Thanks for sharing your designs and experiments with pallets – some good tips on your videos. Especially how you break them down for repurposing. How did you get the dirt to stay evenly between the slats when you raised it vertically? You have a few choices depending on your personal circumstances and plants you are using. 1. You can add some coarse soaked coir peat/coconut fibre or sphagnum moss in between the plants if they are spaced out a lot and the soil is going to tip out. This may help ‘hold’ them in by adding a barrier between the slats. 2. Ideally, if the planter is watered and left horizontally for 2-3 weeks as explained in the video tutorial (http://www.youtube.com/watch?v=qOadilqJeeg), the plants will have an opportunity to develop their roots so they are more established and naturally hold the soil in place. After this time, the planter will be really heavy so you need to consider if you will have help to move/put it in place if you take that route. 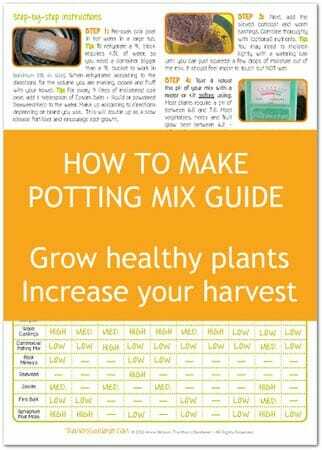 I add nutrients to my potting mix to ensure my plants have plenty of food to draw on to be healthy. 3. Adding a drip irrigation system at the back of the planter not only makes it easier and quicker to water but also ensures the plants get even moisture distribution from top to bottom so the soil is less likely to come out before your planter is fully established. A nice piece of furniture to rest and enjoy the view of your garden. Hope you like it. Oh, and it’s free to copy, share and improve. These ideas are excellent! I’m going to link to this article in our forthcoming ebook because it’s the most comprehensive list I’ve seen. Especially love the table with the centerpiece! C’est magnifique ! You are a magician ! Félicitations du Sud de la France. My son is working on his Eagle project for scouts which involves refurbising an old school pllayground. He has taken some of the ideas from here to make planters for the playground at little cost and high environmental impact for the project! Thanks for the great ideas!! Hi! We really love this article and have shared it on our page! Beautiful ideas! We are launching an exciting interactive upcycling website in the next few weeks that you may be interested in. Follow us on Facebook (The Upcycle Movement) to hear about the launch. Hi What a wonderful way to recycle 🙂 and grow plants! Thanks for sharing your design and ideas with us. I’ve also shared your Bee Hotel design on The Micro Gardener Facebook Page as I’ve just been at a Garden Expo for the last 6 days and everyone was most interested in how to make their own like the one we had on display. Feel free to Like the page and stay in touch. I noticed that some of the pallets are painted/stained. What type of product was used? I want to do something similar to mine but am concerned about food safety. Hi, thanks so much for the info! I’ve already started growing strawberries in a reclaimed pallet and am searching for more pallets to grow more in! I wonder if you can give some advice about HOW to determine whether the wood has been heat or chemical treated. There are lots of pallets lying around near dumpsters and in alley ways in my neighbourhood since it is partly industrial. I haven’t gone in and asked anyone if I can take them because I’m not sure who they belong to. Even if I can determine that, are they likely to know the details about their pallets? Many thanks, again! 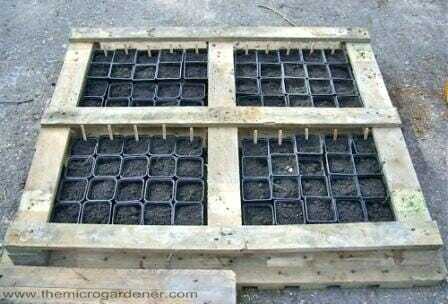 Hi Kerrie, so glad you enjoyed the article and great to hear you’ve already got a pallet garden underway. At the end of the post under Tips there’s a link with more info about pallets: “If you intend growing edibles in your pallet garden, do your due diligence – use heat treated (HT) marked hardwood pallets rather than those that have been fumigated and marked chemically treated (CT) or pressure treated. You can see an image of the Heat Treated symbol here. There are some useful tips on identifying treated wood and which to choose/steer clear of in the following articles: ‘All You Ever Wanted to know about Pallet Wood‘ and ‘How to Determine if a Wood Pallet is Safe for Use‘. This may help you gather more information. I love LOVE love this blog. My husband and I just bought a new house and I can’t wait to use some of these ideas! So glad you like what you’ve found here! I’m very much into repurposing and reusing wherever possible (with safe materials) to tread a little lighter on the planet, use creative skills and save money. I think it’s far more satisfying using your imagination and doing things yourself than always buying new. I hope you enjoy the projects in your new house. You might also enjoy my Upcycled Inspiration Pinterest board to get some ideas. The photos here have so many creative and inspiring ideas for using pallets. I’m actually amazed at the variety! Thanks for posting! Thanks Emmon – great to hear from you. So many of these projects really got my creative juices going too. It sometimes takes a little inspiration to get us thinking ‘outside the square’ of what we can achieve with less. I’m all for reusing and repurposing whenever I can and will be writing more on this in future posts. Stay tuned and thanks for dropping by. Great to hear Jill. I’m not sure which compost bin design you’ll make, but I stapled UV resistant weed mat to the inside of my pallet compost bins and the timber is lasting well. In practice, keeping moisture away from timber is ideal to lengthen the life of the compost bin. Hope this helps and enjoy your project. Great ideas, I never thought about what to do with all our broken pallets, except firewood. We will have to try out some of these! Thanks Mike – let me know what you end up making … all ideas welcome. I often find it’s easier to imagine what’s possible with a little inspiration from other people’s creative ideas … just need a spark to light the fire! Then improvise with your own resources to come up with a creative solution. Have fun! 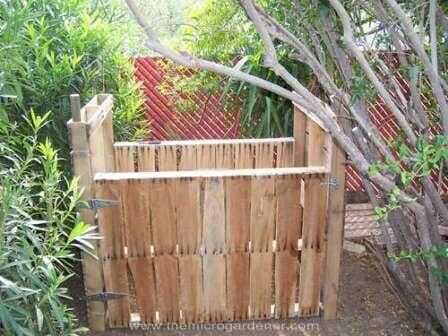 Wonderful ideas~and I have all the pallets I can use for free. We’ve been using them for the wood stove but once woodstove season is over~~~~I’m going to start snagging them and using them in a different way. Thank you so much! Thanks Linda and so great to hear you’ve got plenty of pallets to use. Hope you enjoy your new pallet projects after the cold season is finished. Feel free to share your project with The Micro Gardener community. Some really creative ideas. I would be worried about planting veggies in them though, not knowing what the wood was treated with. Great for flowers though. Hi Sue – totally agree about the timber if treated … I strongly believe in erring on the side of caution. As I mentioned at the end of the post under Tips, “If you intend growing edibles in your pallet garden, do your due diligence – use heat treated (HT) marked hardwood pallets rather than those that have been fumigated and marked chemically treated (CT) or pressure treated. Check what they’ve been used for to avoid chemical contamination. 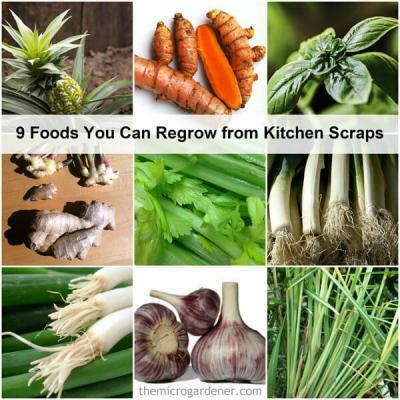 It’s wise to Choose Safe Containers for Growing Food especially with any material with a past life!” So my advice would be if you can’t determine the history, use the pallet for ornamental plants or choose one of the other upcyling projects. 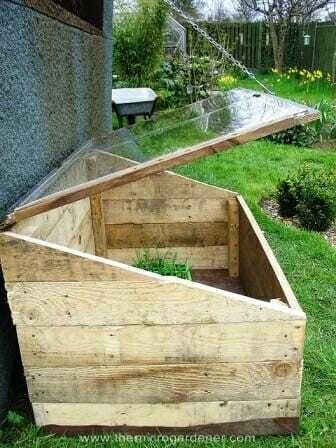 I’m going to construct one to plant some herbs in. I think I’m going to put wheels on the bottom of the pallet so I will be easy to move around. Thanks for the inspiration! Great to hear you’ve been inspired to undertake your own project Jeanette! You can often pick up castors for around $1 at op shop/recycle stores and give them a new life. These stores often have them because they get a lot of donated secondhand furniture, some of which is not suitable for sale but the parts are still useful. Please share a photo when you’re done to inspire others! I sometimes use discarded pallets in the fireplace. They burn really well! One problem with pallets, if you just want the boards – the nails they use. Spiraled or ringed, they like to stay in place! I generally cut the nailed ends of the planks, using the outer studs as a guide. It’s MUCH quicker! And the wood often splits when trying to pry it apart. I’d suggest cutting the ends off, and just dealing with the nails in the center stud. 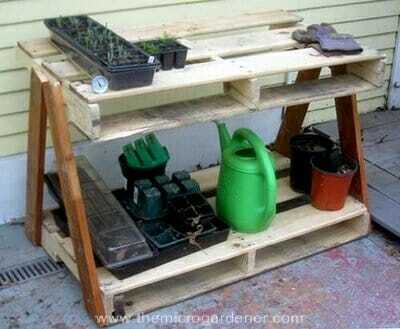 But pallets used this way are a great idea. I often see them for free, on Craigslist. Thanks so much for your tips JJ and sharing how you use pallets. Just a reminder to check before burning pallets that they are non-chemically treated though. Thank you for this amazing site! I’m so inspired by all you’ve done with a humble pallet! Thanks so much for your comment Sarah and glad you have found a few ideas … if we all recycle, reuse and reinvent everyday items whenever we can, we’ll help tread a little lighter on the planet. Thanks for the great ideas. We just moved/bought into our new home. The back yard is not as big as our last house and wondered how are we going to have our garden without taking yard space from the kids. I just showed this to my husband 5 min ago and he is already spacing out the back yard and has me looking on freecycle for pallets. Thrilled to hear that Chaun. Vertical is definitely the way to grow to maximise space. 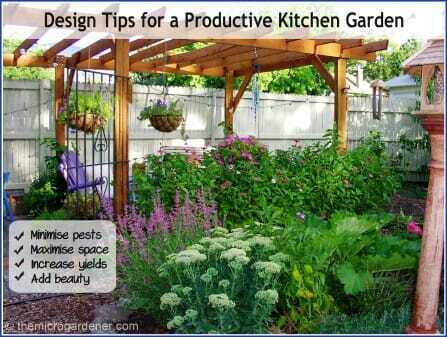 I use lots of different methods and you’ll find more ideas in the Vertical Gardening category. Boundary fences have lots of possibilities as do handrails on verandas and stairs. Anywhere you have a horizontal rail you can also hang a pot or container. You may find some more inspiration with these tiered and stackable ideas. There are also some creative space solutions in my boards on Pinterest – even one for a Cubby House with an edible roof! I hope you enjoy planning your new back yard. Would love to know what you end up doing. Excellent post!!! I build homes from pallets as well as furniture pieces, I am doing some oak flooring on my next piece all from pallet wood!! Thanks David – it’s amazing what we can do with a little creative imagination. Great to see what you’ve been building with natural and recycled materials as well as teaching others these skills. Congratulations. This is awesome. I had a pallet that I was saving to try to figure out how to make a compost bin out of it. But my hubby had the kids tear it apart a couple of weeks ago and I’m not even sure what they did with the wood. Time to find more pallets. Maybe too late for that pallet Michelle but I’m sure you’ll dig one up soon and get the compost bin you want. Mine only took about half an hour to make and it’s solid as a rock in very hot wet weather. Would love to see a photo when you’re done! Good luck. Glad you like the ideas David. I think it’s about seeing ‘resources’ in new ways with everyday items. Hope you find a project you’ll enjoy. Very inspired….love the pallet footpath and fencing particularly. Thanks for the tips! Thanks Susan – sometimes the simple ideas are the most inspiring!